Wash & clean the Ivy gourds. Make vertical slit with a knife cutting three-fourths downwards. Slit all the Ivy gourds and take them into a microwave safe bowl and add 15ml water. Place this bowl in oven and cover it partially. Cook the Ivy gourds on high power for 3 minutes and stir once. Again place the bowl in oven and cover it partially. Cook the Ivy gourds again on high power for 3 more minutes. By now the vegetables are soft enough to handle to stuff the powder. Drain the gourds in a colander and remove water. Cover the colander to retain heat so that the vegetables remain soft. Heat a pan and add 1Tbsp oil to it. Add gram flour and fry stirring on medium heat for 3 minutes. After 3 minutes lower the heat and add crushed dried curry leaves, roasted cumin powder, turmeric powder, red chili powder and salt. Fry all these dry ingredients on low flame for 2 minutes till you get a nice aroma of spices. Take this powder into a plate. Tilt the pan and take the oil with a spoon. Pour this oil on the stuffed portion of each Ivy gourd. The hot oil will wet the stuffing and it stays intact. Then turn the Ivy gourds and fry that side too. Cover the pan and cook for 2 minutes on low flame. Covering the pan will allow the vegetable to get cooked. The oil which we have added will make the vegetable fry. Like this, cover and fry the gourds till they are completely cooked. In this process if you feel the vegetable is getting dried and lacks water to get cooked, add water on the lid and cover the pan. The rim of the lid has a slight depression in which we have to add water. The water evaporates and the vapor condenses inside the pan - the vegetable gets cooked with this vapor. Now if you observe, two sides of the gourds look fried as there will be a slight change in color. Now turn the gourds sideways and cover and cook till done. Once the gourds are fully cooked remove the lid and fry them uncovered for few minutes. Then transfer the gourds to serving plate or bowl and serve hot with plain rice. We can use the remaining stuffing powder by frying it for a while. After removing the fried gourds to a serving plate or bowl, add 1Tbsp of oil to the same pan and add the remaining stuffing powder. Fry on low flame stirring until you get a nice aroma of fried gram flour. Take this fried powder into a bowl and serve with the fried Ivy gourds. Take Ivy gourds which are big in size. Use dried curry leaves for this recipe. If using fresh curry leaves fry them in oil till crisp and them crush with fingers and use. This also gives a nice flavor to the powder. The proportions of spices used may be altered according to taste. Use one teaspoon oil for one Ivy gourd in this recipe. 1Tbsp = 2 1/2tsps ---So use 18tsps or 7Tbsps to fry the Ivy gourds in this recipe. 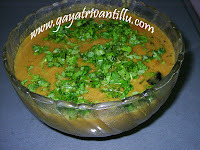 Cooking the Ivy gourds in microwave oven will make them supple to stuff the powder. Frying the gram flour in oil will remove the rawness and brings out the flavor. While stuffing the gourds take care not to press to much or else it will break from the other side - but stuff as much powder as it can take. 1. Add some water to the stuffing and make it like a paste and then stuff. Adding water will change the taste also. 2. Add some hot oil to the powder and make it semi wet and then stuff. Try and adopt which ever method suits you. Serve the fried stuffing powder also along with the fried Ivy gourds. Mix the spice powder in hot plain rice and eat this along with the fried Ivy gourds. The powder tastes excellent – children especially enjoy this powder. Gram flour as it is tastes good—when fried well in oil it tastes even better. Gram flour mixed with spices when fried in oil brings a good flavor. 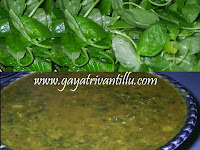 Hi Gayatri garu, I live in chicago...I have tried your dondakaya vapudu. My husband liked it very much and also it was really quick and easy to make.Thanks a lot for your videos. Please add video's for Veg pulav, chicken biriyani also. I'm a vegetarian. I wouldn't be able to help you with Chicken Biryani. But shortly I'm coming up with "Dum Veg Biryani"